Copper futures came under heavy selling pressure on Wednesday, as the U.S. dollar strengthened ahead testimony on monetary policy by Federal Reserve Chairman Ben Bernanke later in the day. On the Comex division of the New York Mercantile Exchange, copper futures for September delivery traded at USD3.139 a pound during European morning trade, down 1.4% on the day. New York-traded copper prices fell by as much as 1.5% earlier in the day to hit a session low of USD3.137 a pound. Copper prices struggled for upside traction due to a broadly stronger U.S. dollar, as dollar-priced commodities become more expensive to investors holding other currencies when the greenback gains. The dollar index, which tracks the performance of the greenback against a basket of six other major currencies, was up 0.2% to trade at 82.80. Market participants looked ahead to Bernanke’s testimony on monetary policy amid speculation over the timing of a possible reduction to the bank’s USD85 billion-a-month bond buying program. Copper prices advanced 2.7% last week after Bernanke said the Fed will continue to maintain accommodative monetary policy for the foreseeable future. Investors also looked ahead to the release of key U.S. data on housing starts and building permits later in the day. Any improvement in U.S. economic activity could scale back expectations for further easing, boosting the dollar and weighing on silver. The Fed’s stimulus program is viewed by many investors as a key driver in boosting the price of commodities as it tends to depress the value of the dollar. Elsewhere on the Comex, gold for August delivery shed 0.5% to trade at USD1,284.05 a troy ounce, while silver for September delivery fell 0.9% to trade at USD19.74 a troy ounce. Moves in gold and silver this year have largely tracked shifting expectations as to whether the U.S. central bank would end its bond-buying program sooner-than-expected. Subscribe accurate copper tips by ShareTipsExpert, to get valuable profit in copper trading. Dharmesh Bhatia of Kotak Commodities advises selling copper MCX around Rs 404-405 per kilogram with a stop loss at Rs 409 per kilogram for a target of Rs 391-395 per kilogram. Renisha Chainani of Edelweiss recommends selling nickel MCX around Rs 830 per kilogram. One can place a stop loss at Rs 840 per kilogram and a target of Rs 810-815 per kilogram. Ravindra Rao of Motilal Oswal advocates selling natural gas MCX around Rs 217. Rao says, “Keep a stop loss for this trade at Rs 222 per kilogram for a downside target of Rs 205 per kilogram”. 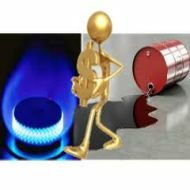 Sumeet Bagadia of Destimoney Commodities suggests selling crude MCX around Rs 5,250-5,260 per barrel. “Maintain a stop loss for this trade at Rs 5,310 per barrel for an initial target of Rs 5,180 per barrel followed by Rs 5,100 per barrel”, Bagadia adds.